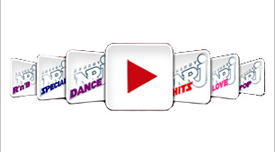 In 2010, again, and for the 4th year in a row, NRJ is in the lead with the highest audience figures in the country for the 15 to 35 year olds category and was ranked number 1 between the English speaking radio stations. Ricky L and MC k, Agnes, Maria Mena, Debi Nova, Supafly Inc, Keith Thomson, Yung Moh, Akcent, Serge Devant and Hadley, Pedro Casanova & Andrea, Greg Parys and Laora, Davis Tavare, Tom Boxer, Michael Diamondz and Alexandra. NRJ, the leader in diversity. to South Africa FIFA 2010 World Cup semi final courtesy of Visa. to Tenerife Spain where some Clash of The Titans movie scenes were shot. In 2010, NRJ is still the only English-speaking radio covering 99% of the Lebanese territories with state of the art broadcast technology. In 2010, and For the First Time in Lebanon and the Middle East, NRJ Launched its very own NRJ Lebanon iPhone/iPad/iPod touch application and became the number 1 free downloaded application in Lebanon. Downlaod volumes reached 184000 in less than 6 months. “NRJ Music Videos” daily and “NRJ SpinMag” weekly, on MTV Lebanon. In 2010, again, we only gave you a hint as of what to expect for the New Year!